It all begun over dinner as most good things do. Having run a joint Masterclass in Lisbon ahead of Social Now 2017, Chris Collison and Paul Corney were sitting in a restaurant overlooking the River Tejo supping a wonderful Alentejo red wine and enjoying Arroz de Marisco when the concept of “The KM Cookbook” was hatched. 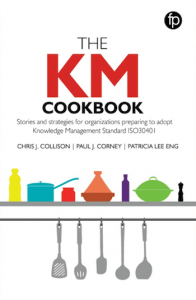 “The KM Cookbook: Stories and strategies for organisations preparing to adopt Knowledge Management Standard ISO 30401” breaks new ground. It takes a look at exemplar KM Programmes through the lens of the new ISO KM Standards. Imagine it as the extra person joining you for a dinner conversation providing an insight from some of the leading KM Chefs in North & South America, Europe, Middle East & Asia. 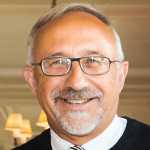 In this session one of the coauthors, Paul J Corney, will describe how the book came to be written and touch on some of the highlights – or Chef’s Specials as they are described in the book. Paul will be on hand thereafter to sign copies of the book which will be available at a discounted price for Social Now delegates.